Complete detail of all areas of the sale including vehicle gross, insurance income, and finance income. 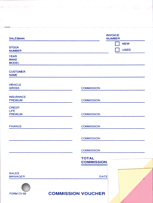 This smaller form has become very popular for providing a copy of each sale and the commission to each salesperson, the sales manager, and the accounting department. Also, a place for sales manager approval. This 3 part form is printed in blue ink on carbonless paper. Hole punched to file copies in a post binder with the paper sequence as follows: Part 1 White, Part 2 Canary, Part 3 Pink. Size is 4-1/4”W x 5-5/8”H. Packaged 100 per pack.